Three games, limited edition Wiimote, and a hat! Okay all you people in the United Kingdom, if you've been holding off on a Wii U NOW is the time to finally get it. This Mario Mega Bundle from the Nintendo UK Online Store is the ultimate deal for all the Mario lovers out there. 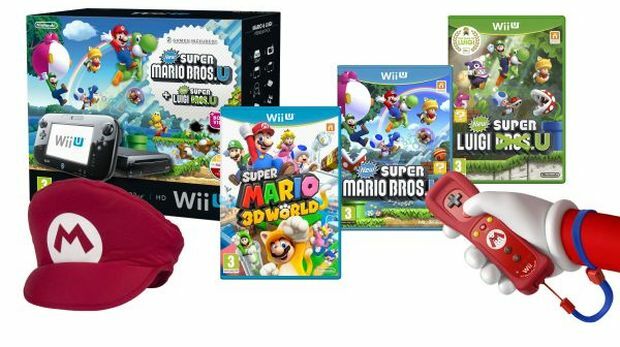 For £299.99 you get the black 32GB Wii U, New Super Mario Bros. U, New Super Luigi U, Super Mario 3D World, a limited edition Mario Wii Remote Plus, and a Mario hat. This is about £50 more than some of the other Wii U bundles from the store, but note that it comes with one of the best games of the year, a rare Wiimote, and most important of all, that hat!